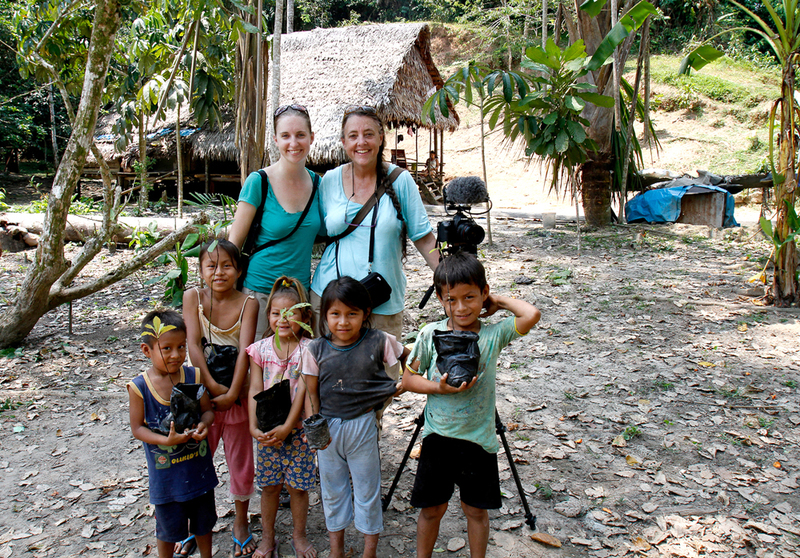 We are two people, mother/daughter filmmakers who embarked on a journey around the world in the summer of 2010. Our mission was to document and film the stories of 11 individuals on 6 continents – ordinary people who are following their own dreams, passions and ambitions and doing extraordinary things. Each of these stories can stand along on their own right, but come together in a feature length documentary about people who are making a positive difference in the world. We use technology, web 2.0 and social media as well as set up screenings all over the world to share these stories and open the eyes of others to what they can do to make our planet a better place. We believe in the power of one – the power of the individual – the power that each one of us has to effect positive change. We are two people who believe in the power of one. On Photography and Video I use the tools of my craft – my cameras – as my eyes on the world. I communicate visually, using both still imagery (“moments in time”) and motion imagery (“time in motion”), to deliver a message in their own unique way. I use whatever medium which best tells the story that I’m trying to tell. I started my career as a still photographer over 30 years ago. About ten years ago, I added video to my skill set. These days I have a foot in both worlds – still photography and motion – many times combining the two mediums on the same project or job. I am interested in “the story” – a person’s story, an institution’s story or a company’s story. Ultimately the stories are about the people behind them – the human story. The stories that I’m prompted to explore are stories about the powerful, the weak and everything in between. I am interested in connecting with people and the human experience and use my cameras as an entree to that end. On Travel, People, Cultures and The World I’ve spent a lifetime traversing the globe and never tiring of it. Each destination and experience has added to my life and I can’t imagine a life without exploration. I doubt there will ever come a time when this need will ever be satisfied. To explore and connect with other people and their cultures is my life’s journey. On This Project I was very excited to do this project, and not just for the travel aspect but I was eager to meet individuals who have done such amazing things with their lives. I love sharing their inspiring stories with everyone. As I prepared to embark on our journey in the summer of 2010, I was anxious to discover more about myself and find out where life will take me next. The journey did everything I had hoped for, and more. Ms. Burns worked in print, fashion runway, theater, cable talk/variety shows, industrial films and commercials, before moving to Los Angeles to study on-camera acting for almost a decade. Ms. Burns appeared in soaps and art films, and partnered as an indie producer of shorts and music videos. Her production company allowed experience directing, editing, and as cinematographer. Motherhood brought a sabbatical due to scheduling, and Angel added to her skill set becoming a commercial and fine art photographer, particularly of dancers, conceptual portraits and world cultures. Her work is now published internationally, appears in galleries & metropolitan exhibitions, and she teaches in traveling fine art photography workshops. Currently producing contemporary, inspirational themes, across multiple visual mediums, Angel continues to travel, shoot still and motion, work to benefit charities, and promote hope and happiness with her work. On This Project Angel came on board in the Fall of 2010 when we met at a conference. Her energy, enthusiasm and knowing “the business” have helped make this dream of ours come alive. She continues to inspire and motivate this team in ways I never thought possible. Tom Kelly is a professional photographer, video producer and father to Erin Kelly. An establishing partner of Kelly/Mooney Productions with life-long partner with Gail Mooney, Tom has produced and shot photographic and video assignments for corporations, magazines and advertising agencies worldwide. Inspiring! I may have finally found a kindred spirit! Check out my like minded post. . . Awesome! Can’t wait to watch. Recently a friend gave me your page and now I’ve become a fan, I have been reading the post from the beginning (January) and I really like, greetings from Mexico. Wonderful effort . waiting to see the documentary. Good luck with your amazing project! It’s so important to report on people who are actively making a difference in the world, and to make us all believe that our little bit can count. I also feel that we need to hear more about people that are helping to bring about change in this world for the better. I never could understand why people are more willing to pay for bad news, T.V. programs, Books and etc.When there are so many good things to be talking about. Too many people don’t realize that are thoughts are seeds and when planted in our minds they will produce either good or bad depending on our choices. What we think is what we create. that’s why we need to take control of what we feed our minds. What goes in will also come out. So why not feed on pure upbuilding, and wholesome things. Because to help bring about a change it has got to start within and then and only then will it appear in the real life. All things got their begining first by thought and then by the spoken word it came into creation. I hope that your trip has been enlighting and that the production of “Opening Our Eyes” is successful. I just recently discovered your blog, and I am thouroghly impressed with your mission and dedication. I am flattered that your are traveling with our Scottevest Travel Vests and hope they have served all of your demanding travel needs. We have engineered our products for travelers just like yourselves. I’m looking forward to the release of your documentary and I would enjoy hearing your thoughts on your vests. Good luck with the last days of your journey. Thanks for your comments this past summer. We loved using our vests and in fact it helped us get on many an airplane. I’ve been following your posts about Delta and I love your tenacity. Our project is not in postproduction and we have launched it on Kickstarter http://kck.st/cTApuP to raise fund for editing. Please consider a donation and/or pass the link to others you know who are like minded in wanting the world to be a better place. WOW! This is a beautiful project. I have travelled a bit; my mother has travelled too much. We have never gone anywhere outside the country together, though. This is something that I should talk to her about. Definitely will try it out with my daughter years and years from now. Happy journeys. Congrats on getting Freshly Pressed. I am here after seeing the recent post over at Shutter Sisters. I must admit to stopping by because of your name. My paternal grandma’s maiden name was Mooney. Maybe it’s common, but I’ve never ran into anyone with the name before, so it grabbed my attention right away. Once I was here, I naturally started poking around the website and I have to say it’s a neat project. And I love that you’re a mother-daughter team. Best of luck! When will the full documentary be available? The full doc should be finished in early summer 2011. I am making a notification list so if anyone would like to be alerted when the film is finished please send an email to me at: gail@kellymooney.com with the subject line “Opening Our Eyes DVD” and you will be notified when the doc is completed. Nice to meet you today today’s minimalist event. OFFICIAL SELECTION FOR ARTIVIST FILM FESTIVAL. Get your tickets here for Opening Our Eyes! I click hosting a screening but it just goes to a mailing system. How can I find info about HOW to host a screening. I purchase rights and show films. thanks!!! this looks fantastic!! !